The Olympia Dakar Dual Sport Jacket has a ferocious appetite for adventure. Thanks to its durable outer shell and unique 3 layer system for temperature and weather condition versatility, the Olympia Dakar Jacket is just as happy chowing down endless highway miles in the driving rain as it is pigging out on tight technical trails with a side of thick brush. Layer One - consists of a rugged outer shell cut in Cordura nylon with ballistic mesh panels for maximum airflow and superior abrasion resistance. Six external pockets, two interior pockets and an oversized waterproof back pocket offer multiple storage options. Additional features include a cushy neoprene framed collar, side waist adjuster straps and reflective detailing at the chest, back and side arms for increased visibility in low light situations. Layer Two - consists of a functional AquaRes laminated rain jacket that can be worn over or under the main outer shell as weather conditions dictate. A stow away hood with a rubberized neck gaiter conceals neatly inside the collar and fits comfortably under a helmet. The neck gaiter provides full circumference waterproof protection as needed. Additional features include 3M Scotchlite reflective piping at the front, sides and back plus side entry pockets and an interior stash pocket for stowing personal items. Layer Three - consists of a removable full sleeve thermal layer with Thermolite insulation and an interior storage pocket. This layer can be zipped into the main outer shell or the rain jacket shell as needed. This handy zip out feature insures multi season riding comfort through a wide range of temperatures and weather conditions. I ride 4 times a week between Santa Cruz Ca and San Jose 14 miles over a mountain 50 mph limits (hah!) and I need to be seen, and be cool in the heat. Jacket does both just fine. I like to lane split standing up on my Triumph Tiger, and everybody can see me, little cars and the big rigs, I'm happy. I was surprised to find out it kept me plenty warm while riding in 30 degree f weather when you have the liners in. Has tons of airflow for the hot days too It is pretty comfortable. Only gripe would be the neck portion, I can't have the top tab closed without feeling like I'm being choked but, that's not really a big deal having that open. Excellent product. All weather in most locales, but I live in Palm Springs with 115 degree summers. I bought this jacket for commuting and touring in California. Its worked out perfect for our weather here. It's always been warm enough in temps down to 40 degrees and has kept me cool in up to 95 degree heat. It's very versatile with the different layers. I'll use the rain liner as a wind break on my cold early morning commute, then use only the shell for my warm ride home. I had the unfortunate opportunity to test how well it will protect me in a crash recently. I ended up with a broken clavicle, patella, ribs, and parts of my vertebrae, but I had zero road rash! Not a scratch! I'd say Olympia is doing something right in the way they design their riding gear. That's why I'm replacing my old Dakar jacket with a new Dakar 2(only because the EMT's had to cut off my old one). Ride safe everyone and remember, ATGATT(all the gear, all the time). GREAT FIT! I'm 5'10" and 220 lbs … OK … 225. The 2XL fit great and looks good too (my wife said so!) The Hi-Viz is *HI-VIZ! * -- so if you're wanting to be noticeable in a heavy traffic environment, this is your jacket. Without the liners, it flows a lot of air, which is what I wanted for summer sport touring in the southwest US in June, July, August. The lightweight thermal liner is just that … lite wgt. I plan on substituting my elect vest in cold weather, so that's fine. I especially like that the rain liner can be worn on the OUTside of the jacket. I am a lifelong motorcyclist and so good body armor is important, and this jacket's armor is all CE rated. Only have appx 1,000 miles of wear on this jacket in the past two months, but am very happy with the purchase. 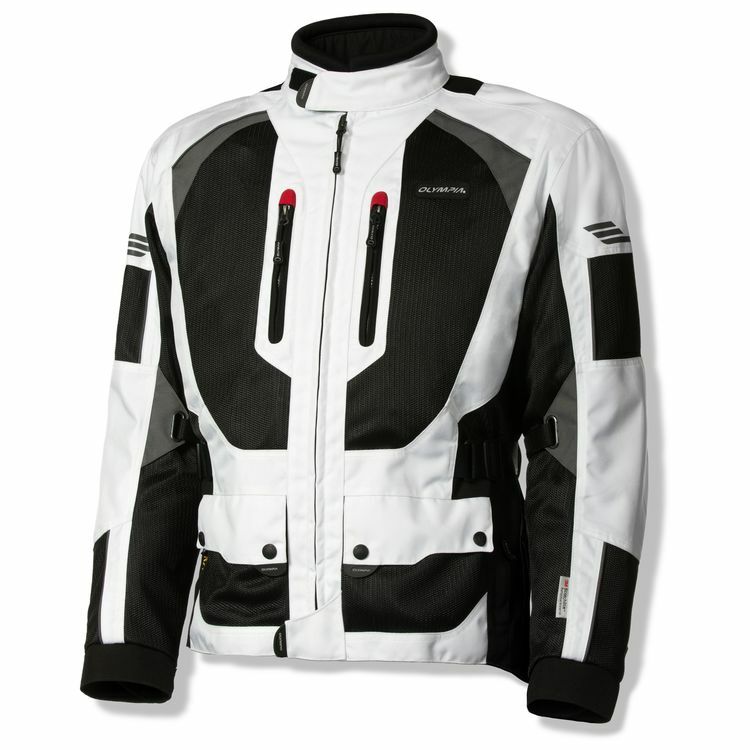 I ordered this jacket looking for a 3 season spring to fall riding adventure jacket after watching the video break down and reading reviews I decided to go with the 3 XL when I received the jacket it was slightly too large so I exchanged it for 2 XL which fit me well. ( my build is 6'4 approx 300 lbs) However after trying the jacket the amour in the shoulders and elbows fit very loose and seemed to move around with in the jacket shell when the liners were removed. I tried cinching down the velcro adjusters on the elbows but they became uncomfortable when bending my arms after due to the placement of the buckles on the adjusters. As far as the shoulder padding it seemed the design of having the armor built in to the mesh lining and not fixed in to the actual shell of the jacket its self allowed it to move a little too freely for my liking and I decided to send the jacket back. ill be searching for something else. where armor is more fixed in place such as my older Joe rocket jacket. That being said it seems this jacket is well built and has a lot of nice features and the styling and the look is awesome. In the end the loose fit of the armor is too much to over come for me though. 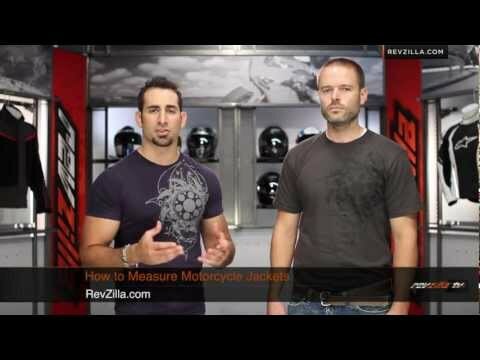 Thanks again to RevZilla for their simple and hassle free convenience when exchanging or returning products will continue to trust and shop here hopefully ill be ordering a different jacket soon! I have had the jacket a short time now. I got it for warm weather riding and for touring days when it's very cold in the early morning and then hot in the afternoon. I love the style and the feel and the fit is great. I am 5'7", 220 lbs (all gut) and the XL fits me close to perfectly. I like the rain liner, especially worn outside the jacket. The one thing they screwed up is the flaps on the bottom front pockets. They chose to lock down the pocket flaps with snaps. Not my favorite but in this case, utterly stupid as they had to anchor the snaps in the mesh that covers the pocket. This means that the snaps pull out of the mesh, even if you are very careful as I have been (because somebody else mentioned this in a review). Why they even have mesh on these pockets is a mystery since all they do is lie down on top of your thighs when you're riding. They don't contribute to airflow at all. I can't even send it back for a new one, because that one will have the same problem, so what's the point. I'm going to try to have my local sewing person put velcro on the pocket flap and mesh, but there's no way to cleanly remove the snaps from the mesh anyway. So, with this one flaw, which is huge in my mind, everything else is awesome. Stopped at a red light, and the SUV behind me did not see the Dakar, even in flouro yellow green or whatever that color is called. Pegged me and I flew 20 ft. Bike is totaled, and my knee is messed up but not a scratch on me. Need a new helmet and a new jacket. If I buy a new bike (and I am going to have to think long about that one), I will buy this jacket again. I had the shell on outside the jacket. The shell was torn, but the jacket is fine. Decided it is time to try the Hi-Vis route and liked this Jacket. Reflectivity and the minimum protection I demand. Have been waiting for this brand and model to come on sale. I live in NW WA and need four season coverage. At this price Ibelieve it is hard to beat. Purported value as provided on RevZilla's site. Really wanted a jacket with airflow, but the thermal liner, plus the water resistant liner that can go on the outside or inside really sealed the deal. Tried on several jackets at a mega dealer with a large selection of riding gear. My choice came down to AirGlide5 or the Dakar2. Since I live in a cooler climate I decided to go with the longer cut. needed a good white and black 3 season jacket. Needed mostly mesh jacket for hot weather use. Water proof liner can be worn over outside of jacket when needed. Like the good assortment of pockets, straps for fine tuning fit, comfortable looking collar. Good reviews. Appears to be good quality for a reasonable price. Dakar 2 fits my style of adventure riding. Usually ride in warmer weather so the three season works. Brand name, lets check it when it arrives. I liked the reviews and the styling. Choice between this model and Firstgear Kathmandu. I ride between hot mountains and the cool California coast. Your rep advised that this model has better ventilation. It fits me better than other manufactures coats. Good price. Good reviews for features and 3 season riding. Will the dakar 2 jacket fit/zip to the airglide 4 pants ? Does the thermal liner zip in the shell without rain liner? BEST ANSWER: Yes, the thermal liner can be zipped into the shell without the rain liner. The thermal liner zips into both sides of the jacket and the thermal liner's sleeves attach to the inside of the shell's sleeves. Nicely designed. Yes - it does. In addition, the rain liner can be worn either over or under the outer shell. It is very versatile. I've only had my jacket for a few weeks, and so far I love it! Yes, the thermal liner, and the rain liner have separate zippers. The rain liner can be worn inside , or outside the jacket. Will this jacket zip into the X MOTO pants? Hi - I don’t have X Moro pants and haven’t tried. Great all season jacket! Im size 40R suite, 5'11", 180 lbs, with long arms. Should I go with a Large or Medium? BEST ANSWER: It depends on how snug you want the jacket to be. I like a little room in my jackets and that being the case I recommend a large. The jacket has cinch straps built into it so it can be snugged down when needed. BTW - I LOVE this jacket! I'm 5' 6" tall and a medium fits me well. So, I'd suggest a Large size for you. Does the Dakar 2 jacket have zipped gusseted wrist closure? BEST ANSWER: No, the Dakar 2 has Velcro closures at wrist on outer jacket and Velcro at wrist on rain layer as well, not zippers. I love my new Dakar 2. It is extremely comfortable and would highly recommend it! No. It uses Velcro straps to cinch the wrist closure. It works well and is not bulky. GREAT JACKET! BEST ANSWER: I do not believe this jacket has a "cell phone" pocket - though every pocket should be able to fit a large phone. my galaxy 6 fits fine, could probably get a couple more in there at the same time. Is the zipper 2 way? BEST ANSWER: Which zipper? There is one for the outside, one for the rain liner and one for the insulation liner, and one for pants in the back. are the chest pockets solid fabric or mesh? BEST ANSWER: Mesh. More like vents than actual pockets. I love this Jacket though. Will this zip up to TourMaster pants? Does the jacket do a decent job at keeping you warm in winter? BEST ANSWER: Not really, unless you live in the Sunshine State! While it is billed as a three season jacket, it is really great in the summer due to the mesh panels. It can be used in the spring and fall with the liners, but not in really cold weather. Below 50 you will really struggle in my opinion. I live in the. Pacific Northwest and I used this jacket for winter riding. The coldest it got was around 20 degrees. This jacket kept me warm.